Celebrate the arrival of the most eagerly awaited film of the millennium by bringing home the insanely funny comedy that started it all: Anchorman: The Legend of Ron Burgundy The "Rich Mahogany" Edition Blu-ray arrives in stores everywhere December 3, 2013 from Paramount Home Media Distribution. Starring Will Ferrell as the titular news anchor who is suddenly faced with the encroaching equality of women in the workplace, Anchorman is a hilarious take on the battle of the sexes. The beloved and treasured film that amazed and inspired a generation also stars Steve Carell, Paul Rudd, Christina Applegate and Fred Willard. 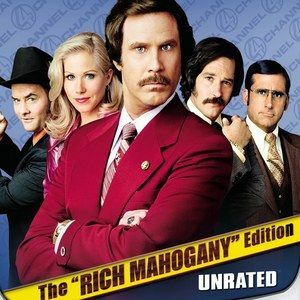 Anchorman: The Legend Continues - The Rich Mahogany Edition two-disc Blu-ray features three versions of the film: the theatrical version, an unrated version and Wake Up, Ron Burgundy: The Lost Movie, all in glorious high definition. The Blu-ray also boasts hours of ultra-classy bonus material including bloopers, table reads, cast auditions, deleted and extended scenes, filmmaker and cast commentary, celebrity interviews, the recording session for "Afternoon Delight" and much, much more. - Raw Footage "Good Takes"